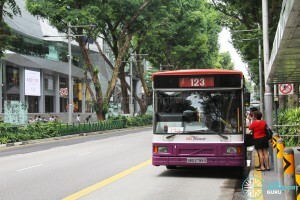 SBS Transit Bus Service 123 is a trunk route connecting Bukit Merah Int and Beach Station Bus Terminal in Sentosa, passing through Queensway, Napier Road, Orchard, Clemenceau Avenue, Havelock, Tiong Bahru and Lower Delta Road, while also operating a supplementary route variant, Service 123M. 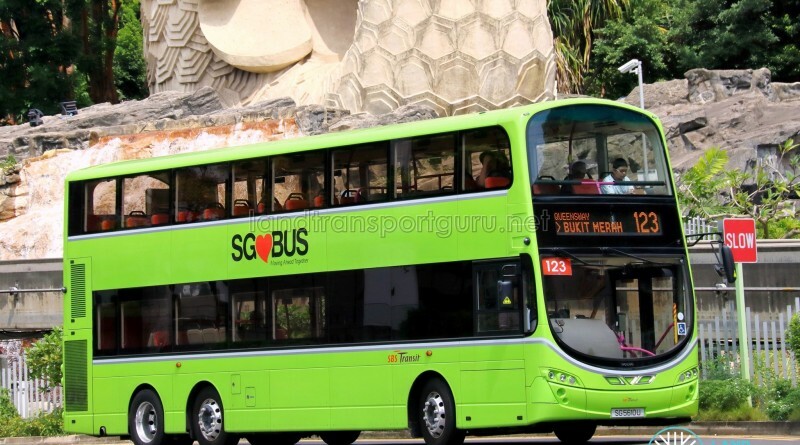 Bus Service 123 towards both Beach Station and Bukit Merah duplicates along Bukit Purmei Ave. Check the bus destination before boarding. 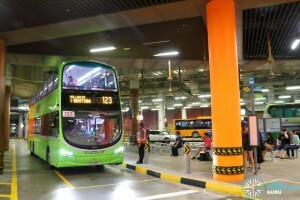 Service 123 is a trunk route connecting Bukit Merah Int and Beach Station Bus Terminal. 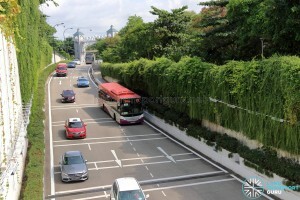 It primarily serves the residential estates along Bukit Merah, Queensway, Tiong Bahru and Bukit Purmei, offering connections to activity nodes such as the Orchard Road district, including Tanglin and Dhoby Ghaut, and Sentosa. This service calls at several bus stops in Bukit Purmei estate twice in different directions, i.e. towards Bukit Merah and towards Beach Station. Red and white service plates are used to distinguish the direction of travel in addition to Electronic Display Signages (EDS) on buses. Red plate indicates buses heading for Bukit Merah; white plate indicates buses heading for Beach Station. From Sunday, 30 July 2017, Service 123 will be amended to terminate at Beach Station Terminal within Sentosa Island, calling at intermediate stops along Artillery Avenue. 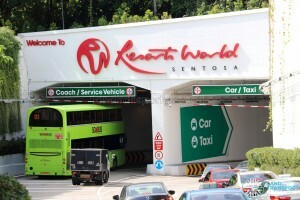 It will also call at Resorts World Sentosa in the direction of Beach Station only. 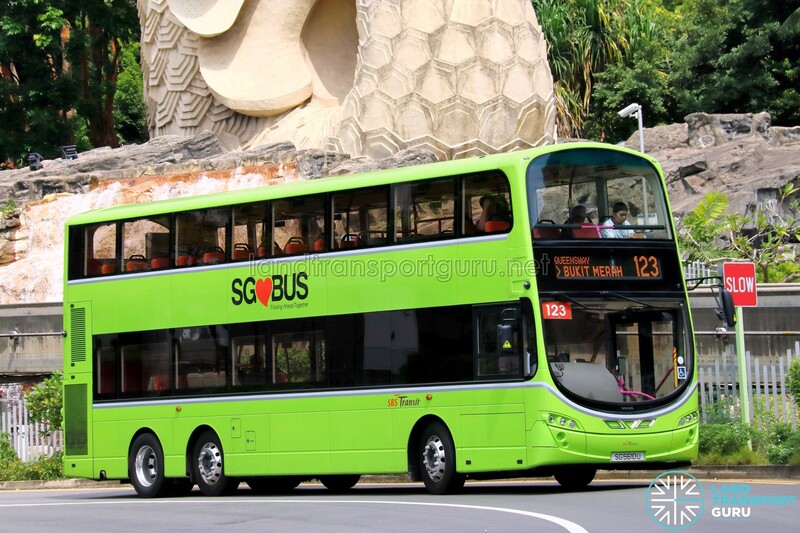 The route will enhance connectivity to Sentosa Island, linking it with Tiong Bahru MRT Station and the Orchard Road shopping belt. 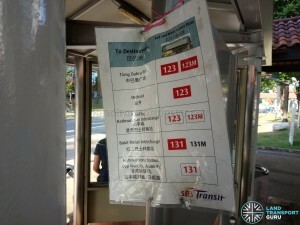 The route amendment will make Service 123 the first regular trunk service to terminate at Sentosa. Currently, Express Services 188R and 963R terminate at Sentosa, which operate only on weekends and public holidays and charge express fares. 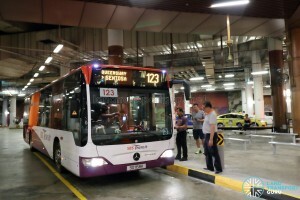 Service 123M will not be amended, and will continue to offer connections between HarbourFront Bus Interchange and Tiong Bahru. 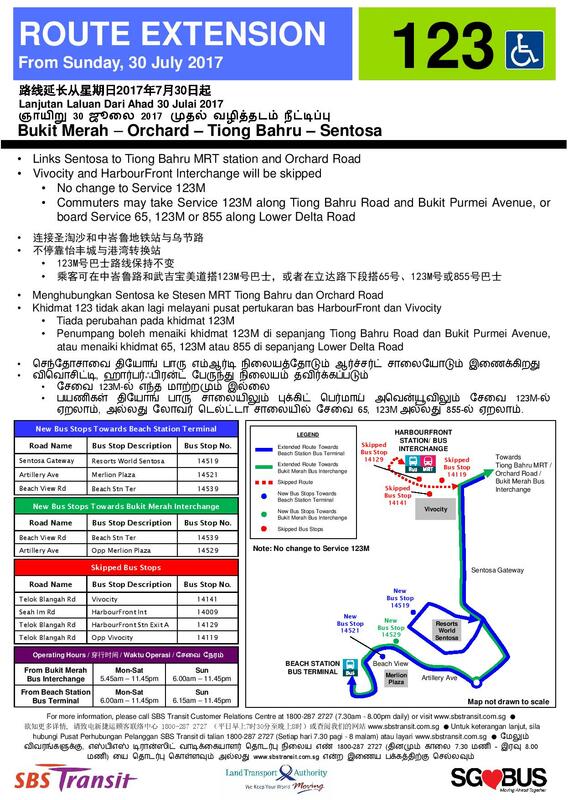 White plated Service 123 buses will head towards Beach Station instead of Harbourfront. 1974 (24 Feb): Amended to ply Grange Rd and Orchard Blvd with the conversion of Orchard Rd to one-way road, skipping Orchard Rd. 1987 (01 Oct): Amended to ply Eu Tong Sen St towards St. Michael’s Ter to facilitate the second stage of road expansion along New Bridge Rd. 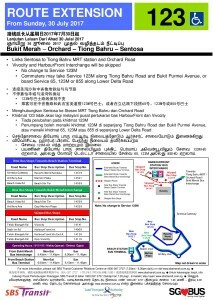 1993 (04 Apr): Shortened to loop at Tomlinson Road when service 124 was amended. 1993 (23 May): Merged with service 14 and amended to ply between Bt Merah Int and Bt Purmei Ave via Queensway, Holland Rd & Orchard Rd. 2008 (28 Jan): Service 123M was introduced to replace Shortworking trip 123B. 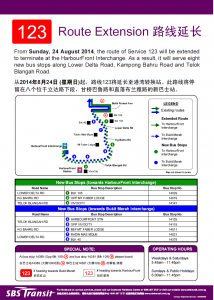 2014 (24 Aug): Extended to HarbourFront Int and converted to a bi-directional route. 2017 (30 Jul): Extended to Beach Station Bus Terminal. Start of Double-decker deployments. 2017: Amended to present routing. No significant route changes since 2017. 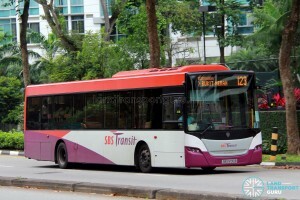 Will SMRT’s 188R and 963R (either one will do) use them too? The demand of 188R and 963R is not high enough to support the use of double decker.